The Ford F-150 remains the most popular pickup truck model in the United States. It comes in a wide range of trim levels that start at $24,735. The venerable full-size truck seats a driver and two to five passengers. Although it can be difficult to park, this Ford vehicle is known for its powerful engine, high cargo capacity and luxury add-ons. Aside from A/C and an automatic transmission, the F-150’s basic trim offers few extras. It provides a two-band radio and a cloth bench seat. Drivers with enough cash may add a wide range of options. They include a rear-view camera, navigation system, high-end CD player, remote starter or leather seats. Four-wheel drive is also available. Ford offers four different engines for F-150 buyers; they range from 3.5 to 6.2 liters. With the right equipment, this pickup can tow a maximum of 11,300 pounds. It also carries cargo weighing up to 1.41 metric tons. Nevertheless, this power comes at a price. The U.S. Department of Energy reports that it travels about 13 to 21 MPG. MotorTrend reports that the Ford F-150 has performed well in multiple crash tests. Still, it has also been the subject of at least one recall in the past few years. 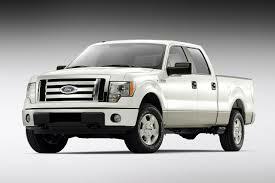 The manufacturer recalled over 1 million F-150s in August 2011, according to U.S. News and World Report. This recall affected pre-2005 trucks with problematic gas tank straps. Reviews of the F-150 reveal how it has become so popular. Motor Trend rates the truck five stars, praising its towing capacity and optional features. Consumer reports applauds the pickup’s performance but calls its handling “clumsy” and criticizes the V6 engine’s dependability. Meanwhile, Cars.com users rate the F-150 an average of 4.7 stars.